Ads like this one appeared during the California Gold Rush luring people to try their luck panning for gold in California. 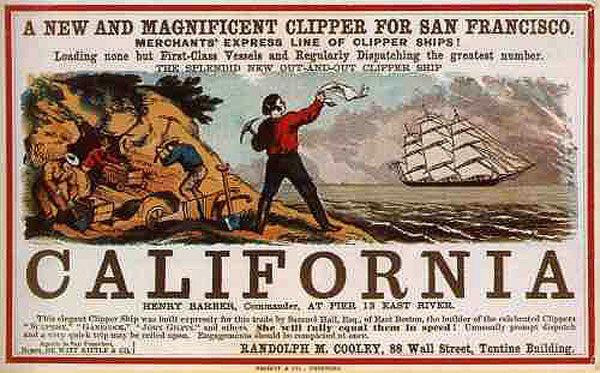 Ships like the clipper featured in this ad promised quicker, safer travel than land travel across the States from the east coast. On January 24, 1848, a carpenter named James Marshall made a startling discovery while working in the American River near Coloma, California. "It made my heart thump," Marshall later recalled, "for I was certain it was gold." Marshall shared the dramatic news with John Sutter, who had hired Marshall to build a water-powered sawmill on his property near Lake Tahoe. The two tried to keep the discovery to themselves, but word quickly spread. Migrants seeking to make their fortune by mining gold—known as "49ers"—rushed in to the area; thousands came from San Francisco, while others traveled from across the United States and from as far away as China and Australia. Approximately 80,000 newcomers flocked to California in 1849 alone. As "gold fever" spread, mapmakers and book publishers created maps and guidebooks for the prospective miners. These publications offered suggestions on what to pack, along with advice on how to tell if gold was authentic and how to reach the areas where gold had been discovered. Published around 1853, the map featured in this segment was unusual for several reasons. Unlike many other maps of this territory that were produced on the East Coast, this map was created in San Francisco, by the lithographers Britton & Rey. Their map was praised for its accuracy, particularly its depiction of the border between California and the area labeled as Utah (now Nevada). Miners carried the Britton & Rey map in their pocket as they trekked across California seeking to strike it rich. As the appraiser points out, this map is exceedingly rare: few copies have survived, and none has been sold at auction in the past 30 years. Using context clues provided in this segment, come up with your own definition for the term "pocket map." When was the pocket map being appraised here created? Who were its primary users? How does this map of California differ from most other maps of the state that were produced during the Gold Rush? In what ways is the map's history evident from its current condition? What is the appraised value of the map? What factors help explain its worth? Does the appraiser’s estimate surprise you? Why or why not? What is the guest’s personal connection to this map? Are there items in your household that you think would be of interest to ANTIQUES ROADSHOW viewers and appraisers? Discuss as a class and, if time allows, bring in some of these items to share with classmates. Compare the map featured in this segment to an earlier or later map of California. You’ll find a high-resolution version of the 1853 map on the Roadshow website here, and a set of historical maps here. (You could also compare the 1853 map to a contemporary map of the state.) What differences do you see? What do you think accounts for these differences? Share your findings with members of your class. Sharpen your map skills by playing an interactive game created by National Geographic Education. Visit http://education.nationalgeographic.com/education/topics/map-games/?ar_a=1. Then scroll down to the middle of the page and click on the "Grades and Ages" filter. Select your grade and choose one of the games designed for your age level. These include GeoGames, which is intended to develop geography mapping skills and can be played individually or with a group; GIS In Action, which uses maps to help animals while solving problems; and Explore Mars and Explore a Pyramid, in which players read and interpret maps as they investigate new environments. Create your own customized map by using the interactive map-making tool at http://www.arcgis.com/home/webmap/viewer.html. To start, enter an address in the box at right or select an area of the world map to zoom in on. Then click on the "Basemap" tab and choose one of the options. Follow the steps in the box at left to complete your map by adding images, charts and descriptive text. To deepen your understanding of the power of maps, create a second map of the same location; for this version of your map, choose a different Basemap and different features to display. Print out your maps and create a gallery for your classroom or another area of your school. How would you have fared as a miner in the Gold Rush? To find out, go to http://www.pbs.org/wgbh/amex/goldrush/sfeature/game.html and see if you have what it takes to strike it rich by playing this interactive role-playing game, created to accompany an American Experience documentary on the Gold Rush. After playing, write a one-page reflection in which you comment on what led some miners to strike it rich and others to fail in their quest to find gold. What challenges did the physical environment pose to miners’ pursuit of gold? And in what ways did miners respond to these challenges? Begin your investigation by analyzing the map featured in this segment and coming up with a set of questions about the relationship between miners and their environment. Then consult at least three documents created during the Gold Rush to find answers to your questions. You’ll find dozens of first-person accounts and primary-source documents in the online collection "California As We Saw It: Exploring the California Gold Rush," at http://www.library.ca.gov/goldrush. After conducting your research, present your findings in the form of an advice column—including tips on what to do as well as what to avoid—for men and women who were thinking about heading West to seek their fortune as gold miners. This website features extensive background on the field of cartography; links to sites that display historic maps, with a focus on California maps; tips on starting your own map collection; and a section on "Cartographic Curiosities," including maps as puzzles and games, and maps created using unusual materials. This companion website to a PBS documentary offers biographies of key participants in the Gold Rush, a timeline, a map, a discussion guide, and interactive special features, including an online poll, stories of Native Americans' experiences during the Gold Rush, and the role-playing game Strike It Rich (highlighted above). Written for young adults, this lively historical narrative draws from journals, letters, photographs, and other sources to tell the story of women who participated in the Gold Rush.